I have always had a love for Japanese fashion. I have countless Japanese magazines, books and follow many Japanese models blogs. Can't understand a word of what they say but the way they piece together outfits and the way they edit their photos inspire me! My favorite magazines are Zipper, Popteen and Nylon Japan. 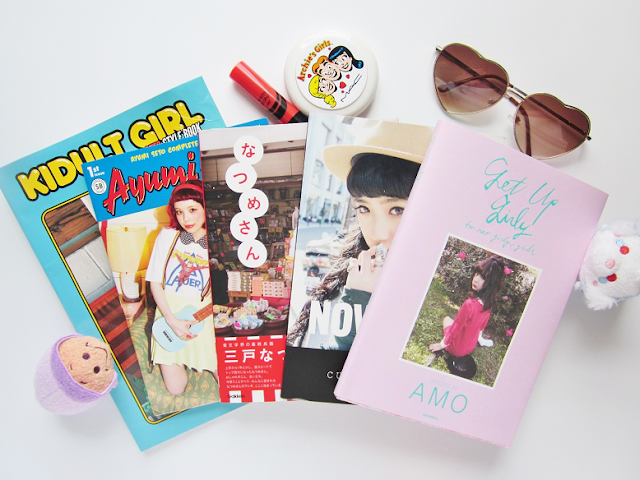 As for books, I have a stack of Harajuku fashion bloggers/models books that I will be showing today. Every model has a different style so each book is unique. This was my first ever model book. 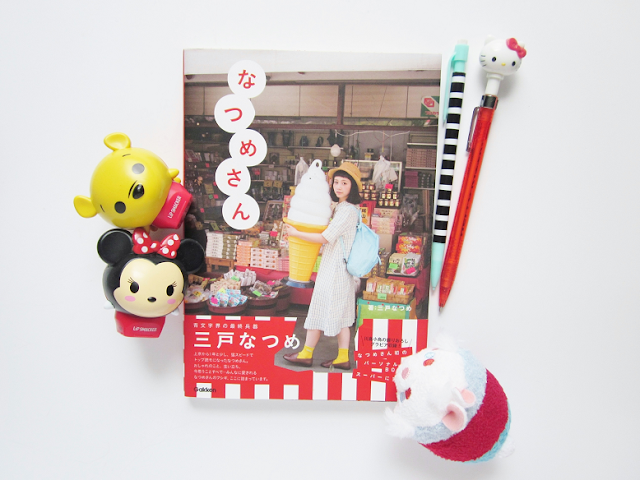 I first saw a preview of this book on Harajuku Kawaii TV (what ever happened to that show?) and I was hooked! Her style is quirky kid meets stylish grandma. She's not my favorite model but I love her odd taste in fashion. You can see a preview of this book here. Ayumi is my all-time favorite Japanese model and the one who got in interested in Harajuku fashion. Her cute doll-like features is what drew me to Ayumi. Her style is high school tom boy with a hint of retro flare. In Ayumi's first fashion book it features many of her past looks, lifestyle favorites, beauty looks and tutorials, along with a inside look at her brand, Aymmy. A few years past and now Ayumi has a second book! It's bigger and contains more content then her first. In Ayumi's Style Book it shows how her style has evolved since her first book. This book offers a closer look at her current looks, beauty and lifestyle favorites. She also shares her past hair cuts and styles. There is also a closer look at her (now successful) fashion brand, Aymmy. I think it's amazing how far her company has come since she released her first book! I'm so proud of Ayumi! I would've shown a preview of this book like I have with all my Japanese model books. However, the book got wet in the mail and is all wrinkly now. You can't tell in the picture but in real life it looks like a dried up newspaper. I could have returned it for a new one but that would've taken longer (it took me like 2 months to get this book) and then I would've had to pay for overseas shipping so I just kept it instead. Now onto Culumi's style book, Nowhere. I became interested in Culumi's style after seeing her hang out with Ayumi so often. Her style is dark 90's grudge rock chic. Culumi own's this look though and makes her causal outfits look effortlessly fashionable. She wears a lot of black (which isn't my cup of tea) but how she wears it with black hair inspire me to play with my look. I myself have black hair and hate wearing too much black because I feel like a goth. Preview here! Out of all the books I've shown this one suits my aesthetic the best. Amo is a very popular Harajuku model who models for various brands. She's one of my favorite models (next to Ayumi). Her style is really feminine with a splash of cutesy girly. She's like the Alice of Wonderland (by wonderland I mean Tokyo). I love it when she wears cute outfits but I've noticed she prefer simple feminine looks now. 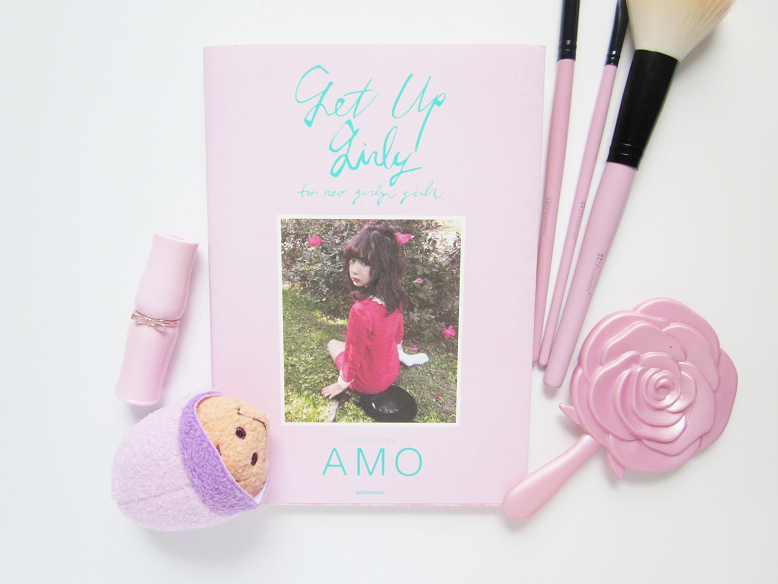 This book is really cute and her recommendations are amazing! Definitely pick this book up if you're a girly girly like Amo and I! Are you a fan of Japanese fashion?